The Twin in Berlin: Seriously I Was In Heaven And Just Felt Like I Was Floating Up In The Clouds! Seriously I Was In Heaven And Just Felt Like I Was Floating Up In The Clouds! Just when I thought life couldn't get more wild, IT DID. This week was voll cool, wie üblich. But I will share our MIRACLE that took place just yesterday, on Sunday. BUT FIRST flash back to LAST Sunday. We were all set for Ruphi to come to church. she didn't. That day we fasted that we could find new people to teach, and that those already in our care, Ruphi and Familie Mit would be able to progress. Fam Mit doesn't have a car or even money to buy a ticket (their baby is big enough to last that long away from home now) so we asked at ward council this week if someone would be prepared to give them a ride. Amazingly there is a family that has kids the same age, so they had car seats that were fitting for the Mit girls. Familie Mit was excited, and they also have been reading daily in the Book of Mormon, even when it's been crazy. WOO. Sooo Sunday we went with the Sister, and THEY CAME TO CHURCH!!! They were really grateful even though they didn't understand everything. Just when I though it couldn’t get better IT DID. So we were sitting there in the third hour, Relief Society, Frau Mit was keeping her little baby quiet, and we were trying to entertain the daughter (she was too shy for Primary!) and then all of a sudden the door opens AND IN WALKS RUPHI STRUTTIN HER STUFF, and she just smiled at us and took a seat on the front row with her baby. My mouth literally dropped open. It was so unbelievably miraculous and wonderful. WUNDER SONNTAG. Seriously I was in Heaven and just felt like I was floating up in the clouds. We have not had any investigators at church since I've been here, and then all in one day THREE of them came. man. What a life. It was such a testimony to me that God hears our prayers and recognized our faith, when we exercise it! I know that our efforts do matter. We had some awesome conversations this week. Sometimes my heart just melts for some of the people we talk with, and sometimes it takes all of my self control not to tell them what fools they are. I am so grateful for the example of our Savior, Jesus Christ. His love is perfect. He is there for me at all times, and knows how to comfort and help me. I am not perfect, but He is. I can't do everything, but He can. I know that He lives. 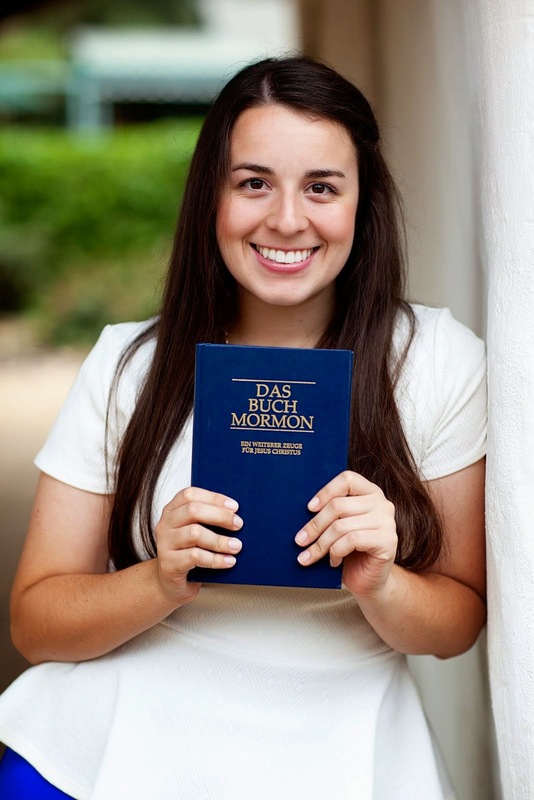 I am so grateful I can share my testimony of Him with the people here in Germany. My testimony is so precious to me. So kostbar! Tomorrow we are invited at Schwester Leuschner's! I am soooo excited. Can't believe this is Megan's final week. GEHT'S LOS!!!! I LOVE BEING HERE SO MUCH. HAVE A PARTY TOMORROW IN HONOR OF YOURS TRULY I WILL MOST DEFINITELY BE PARTYING IT UP HERE ON THE STREETS OF DEUTSCHLAND!!!! "Wir leben und wir sterben HIER"